Abandoning the Paris climate deal? 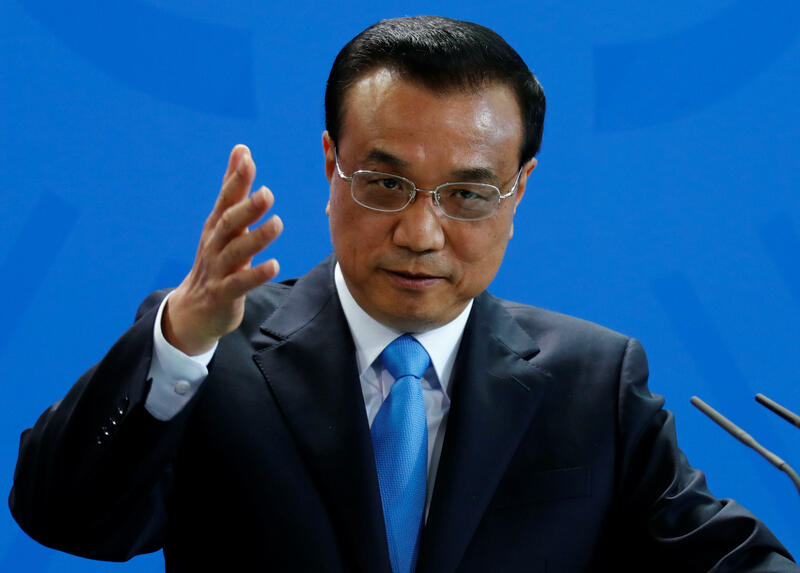 BEIJING -- Chinese Premier Li Keqiang vowed to work with the European Union to uphold the Paris climate accord Thursday, saying that fighting climate change was a "global consensus" and an "international responsibility." Speaking in Berlin about the Paris climate deal, he said that, "China in recent years has stayed true to its commitment." Without mentioning the U.S. specifically, he said China has been "actively promoting the Paris agreement and we were one of the first countries to ratify the Paris agreement." He added, "Fighting climate change is a global consensus, it's not invented by China... and we realize that this is a global consensus agreement and that as a big developing nation we should shoulder our international responsibility." German Chancellor Angela Merkel, who has in the past even been dubbed the "climate chancellor" for her efforts to fight global warming, welcomed Li's remarks at their joint press conference. Other European leaders were more explicit in expressing their fears that the U.S. government may abandon international measures against climate change. "Please don't change the (political) climate for the worse," European Council President Donald Tusk tweeted. British Foreign Secretary Boris Johnson said Britain would continue to press the U.S. to reduce dangerous emissions even if Trump pulls out. The Kremlin said Russia was committed to the agreement. Speaking to reporters, a spokesman for President Vladimir Putin, Dmitry Peskov, said that Russia "thinks highly" of the accord and there was no alternative to it. But he added that its implementation would not be as effective "without the key signatories." Martin Schulz, a former European Parliament president who is hoping to unseat Merkel in Germany's upcoming general election, said he hoped Trump would think better of withdrawing from the accord. If the U.S. does leave, he said, the Europe Union should seek ways to balance out the economic advantage that U.S. companies might have from the absence of climate regulations. "Those who want to export their goods and services to our market also have to accept our standards," he said. During a trip to Europe this week, Indian Prime Minister Narendra Modi expressed India's commitment to fighting climate change and said it would be a "crime" to spoil the environment for future generations. President Donald Trump is expected to announce his decision on whether to abandon the Paris climate accord Thursday afternoon. Abandoning the pact would isolate the U.S. from a raft of international allies who spent years negotiating the 2015 agreement to fight global warming and pollution by reducing carbon emissions in nearly 200 nations. While traveling abroad last week, Trump was repeatedly pressed to stay in the deal by European leaders and the Vatican. Withdrawing would leave the United States aligned only with Russia among the world's industrialized economies. While not mentioning the U.S. by name, Chinese Foreign Ministry spokesperson Hua Chunying told reporters overnight that climate change is a "global challenge" that no country can ignore, and that her country would work with the European Union to uphold the deal, even if the U.S. pulls out. "No matter whether other countries' positions may change, we will continue to uphold" a model of sustainable development, Hua said at a regularly scheduled news conference. When asked about whether China had spoken to the Trump administration about the climate agreement, she said, "China and the United States have close communications about a wide variety of topics, and of course, this includes the issue of climate change." China is the top emitter of man-made carbon dioxide emissions, and the United States is second. Both were key to reaching an agreement at Paris in 2015, which came into force in November and aims to keep global warming below 3.6 degrees Fahrenheit compared with pre-industrial times. Trump claimed before taking office that climate change was a "hoax" created by China to hurt the U.S. economy, an assertion that stands in defiance of broad scientific consensus. In March, he signed an executive order to roll back Obama-era policies regulating carbon emissions. Trump said he wanted to create more coal mining jobs, though industry analysts say demand is likely to decline as the price of solar, wind and other alternatives falls. Scientists say Earth is likely to reach more dangerous levels of warming sooner if the U.S. retreats from its pledge because America contributes so much to rising temperatures. Calculations suggest withdrawal could release up to 3 billion additional tons of carbon dioxide a year - enough to melt ice sheets faster, raise seas higher and trigger more extreme weather.